Will private funding save public music education? 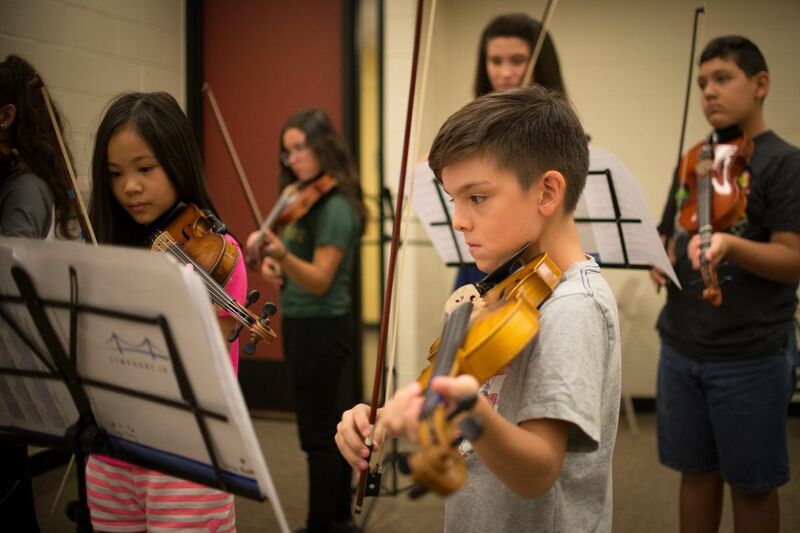 Gabriel Gil, 11, of Grays Ferry, is able to attend Symphony in C’s summer camp at Rutgers University courtesy of the Philadelphia Music Alliance for Youth. Is a restoration of serious arts education to the lives of our children finally within reach? A lot is riding on the answer. Ask any arts leader why getting audiences is so hard and you'll get the same response: Lack of arts in schools. Children today aren't growing up with the sound of an orchestra in their heads, so, naturally, they aren't becoming ticket buyers, the mantra goes. I'm not convinced that the return of arts to schools will repair the pipeline to concert halls, but that doesn't mean every child shouldn't be getting a sustained, sequential education in the arts. After all, what about simply wanting our children to have access to a cultural tradition that contributes to the common good by turning out well-rounded human beings? Whatever the motivation, there are signs that music education in the city may be on the way back up. Intensive after-school neighborhood music programs like Play On, Philly! and the Philadelphia Youth Orchestra's Tune Up Philly have been up and running for a few years now. The All City Orchestra program has new energy and increased support from the School District of Philadelphia and Philadelphia Orchestra. This school year, the ArtistYear program will place 12 arts teaching fellows in area schools with a high percentage of children from low-income families. The program isn't intended as a substitute for full-time arts instruction, but as a catalyst to "develop more arts programming, so that they add a full-time arts teacher and over time the school has more resources," says Christine Witkowski, director of ArtistYear Philadelphia. The Mann Center is pondering a bigger role. The arts center has some incredible assets: It's right there in West Philadelphia, offers potential space for new facilities, and hosts artists and ensembles all summer, when many students are at loose ends and could be using concentrated time for rehearsals, lessons, and master classes. Foundations signal a direction for community priorities by what they do and don't fund, and recent grants are telling. The William Penn Foundation has boosted its emphasis on arts education. It has given more than $12 million to arts education during the last four years — up considerably from the $2 million to arts education it gave in the previous four years. The Mellon Foundation recently awarded more than $2.5 million to a new program called the Philadelphia Music Alliance for Youth that is aimed at talent from underrepresented communities. In its first year, the initiative of 10 Philadelphia groups, including Settlement Music School and the School District of Philadelphia, will give 75 music students in grades four through 11 financial support for lessons, music camp, and other training opportunities. This summer, an 11-year-old violinist from Grays Ferry and a 13-year-old double-bass player and 17-year-old clarinetist from the Northeast have all been able to join Symphony in C's music camp. Yet another foundation has taken on an important piece of the puzzle. The Neubauer Family Foundation is working to figure out what arts education programs are here already to determine what's needed, to "better align the arts education ecosystem across the city," says foundation executive director Rebecca Cornejo. The initiative, with the Philadelphia Orchestra, University of Pennsylvania, and School District of Philadelphia, documents the music, visual arts, theater, dance, and media arts programs currently offered to create an interactive map of arts resources in public schools, a table comparing needs and desires, and an exploration of approaches that have been successful in other cities. Cornejo says the work "will truly benefit thousands of students across the city." There are already hopeful signs in public schools. Frank Machos, executive director of the office of the arts and academic enrichment for the School District, says there are 425 arts educators for 129,000 children in the system, "and we've got it to where 90 percent of kids have a certified art [or music or dance] instructor in the building. That's been consistent growth since 2013." The district already is paying more than $50 million per year on arts salaries. Still, only about 58 percent of students currently have access to both art and music. The priority is to bring weekly sequential arts instruction to every student in kindergarten through fifth grade, he says, "and I'm pretty optimistic that we can meet that in three to five years." Each of these efforts represents a significant victory. Most heartening, there seems to be an atmosphere of collegiality among arts groups, foundations, and the School District to create a coordinated approach. It's as though every arts leader in the city woke up at the same time to an aching need. But as these initiatives and others yet to be officially announced get off the ground, it's worth recalling the animating force of the golden age of arts education in this country in the 1940s and '50s; that classical music heard at school was reinforced at home, in the media, and through peers. Obviously, that world is gone. What will a smart education in the arts look like today, and how will we define success? Is it best to teach introduction to harmonic analysis, or sound-engineering apps and music entrepreneurship? The three stylistic periods of Beethoven, or the history of social protest songs of the United States.? Access for everyone will be critical. If some students get a first-class arts education and others have none, we will be creating yet another system of haves and have-nots. Equality and fairness are two good reasons to make sure every student gets an instrument put in his or her hand. Equally important, the net must be cast wide to capture all the talent out there. At any given time in Camden or West Philadelphia, a Yo-Yo Ma or Jennifer Higdon sits in first grade or 10th, awaiting the right growing conditions. "We've got to move away from finding just the top 100 kids," says Stanford Thompson, founder of the Play On, Philly! after-school music program. "I hope one day we have 13 All City Orchestras all feeding into one top group and 30 Play On orchestras, because there are hundreds of thousands of kids in the city." The point is, arts education can't be just for those students who are clearly headed for Curtis or Juilliard and a life on stage. It has to also be for those who will end up on the other side of the proscenium — as listeners, board members, and donors. How will arts advocates prove success? As each of these initiatives rolls out, there will be accompanying research evaluating the benefits: measuring how an arts education improves grades overall, reduces stress, or promotes social intelligence. Many of these claims may, in fact, be true. But they miss the point that an arts education is intrinsically valuable. The arts are a way in to thinking, growing, feeling, knowing, and questioning — all of the qualities parents wish for their children. Each arts experience is like falling into a web whose strands lead to other worlds. Listen to Debussy, and you can be led to Ravel, Fauré, Nadia Boulanger, and the entire Paris Conservatoire tradition. Go another way, and the path from Debussy takes you to Maeterlinck, Poe, or Edmund Dulac. Listen to some of his piano pieces, and you've stepped outside of Western music altogether and are considering the Gamelan. Other works deliver you to the end of traditional harmony. It's all very personal, and not the sort of "outcome" that necessarily shows up in research correlating increased arts exposure to higher test scores in math and reading. As ever, and no less so in this data-driven world, the hardest thing to measure is sometimes the most valuable.